This is a guest post by freelance graphic and web designer Ashley Dorendorf. Freelancing is exciting and liberating, yet daunting and difficult. You are either held back by the fear of taking a huge risk with your career, or you have already taken the leap but things don’t seem to be going anywhere. It can be frustrating, can’t it? You know success in freelancing and running your own business is not only possible, but can be lucrative. It is just knowing what steps to take in order to be successful and thriving. The process is not easy, and it does take a lot of hard work, but it is totally possible. Although the road to success may not be paved, there is a general process you can follow to get to where you want to be. I have been struggling, learning, and growing as a freelancer for many years. I have failed, risked my freelance career on multiple occasions, and worked with clients all over the country—all while observing the work of others more successful than myself and being able to distill their success. What I have learned over the years is that you can achieve success much quicker if you start by setting yourself up for success. You don’t have to spend years establishing yourself. So what can you do to build the foundation of your freelance business? Start by being 100% committed. Starting a business takes time. Getting started sooner rather than later is the best. Define details and establish attainable goals to work towards, no matter how big or small they may be. Who are your clients and how do you plan on helping them? What results are you looking for with your marketing? How much will you charge per hour? In order to make ends meet, how much will you need to earn each month? What type of business expenses will you have? How will you diversify your freelance income outside of client work? Even if you don’t have all the answers yet (which you likely won’t), putting your plans and ideas down is a significant step in the right direction. 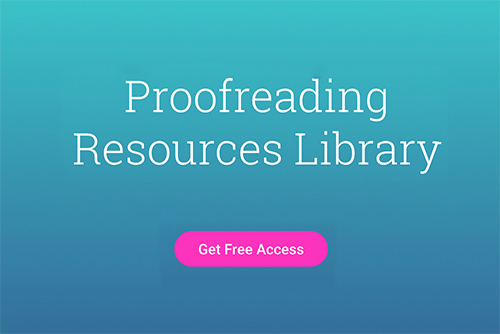 Phon’s Note: If you want to learn more about freelance proofreading, we’ve got a free training workshop for you! Register now for “How To Work As A Proofreader For Businesses & Writers Even If You Don’t Have A Degree.” You can sign up here. Figuring out your rates is crucial to building the foundation of your freelance business. You may choose to charge hourly, by project, or by service — that is a personal decision. But having something in mind is tremendously helpful when estimating client projects. Start simple. Maybe design a simple monogram with your initials. Then develop a color scheme that can be applied to everything (logo, marketing materials, link colors, etc.). Create a website either through a platform like WordPress or Weebly, or hire a designer if you do not feel up to the challenges that may arise. Once your website and portfolio are created, upload your best work—be sure to stick with the brand identity. You can use Facebook, Twitter, Instagram, etc. Again, it is important to stick with the branding identity because consistency is key. With your new accounts created, make sure you give your followers a reason to follow you. Share useful links, posts created, and connect with others on a personal level. Before reaching out to clients, it is important to create essential business documents needed to confidently reply back with the necessary next step. Start with a generalized freelance contract and invoice. Nothing too elaborate is needed when starting off, but it is important to have something professional to present to a potential client. Here is where the fun starts. Begin looking for businesses within your target market. You can look on LinkedIn, Facebook, local businesses, etc. Make note of these businesses and any contact information. This is where a spreadsheet is very useful for sourcing. Compile a list of 15-20 potential clients you would like to work with. It can be a local business you think can benefit from your services, an organization that needs help, or even an agency that may have some run-off work you can help with. Focus on compiling this list of names and emails as you will be using this list to reach out, introduce yourself, and to inquire about freelance work. This is your chance to define your target market, so really do your research on the type of clients you would like to work with. Now that you have your well-established brand, essential documents, and a compiled list of clients, it’s time to put it all to use. Start emailing and pitching to 5-10 potential clients to start. This seems daunting at first. But it gets easier as you get more comfortable. When reaching out via email or phone, it is important to remember to contact someone within the business directly—ie. the owner, marketing director, etc. Also, be sure to make each pitch email unique and personalized. You are more likely to get a response when you take the time to show you did some research and have a genuine interest in their company and what they stand for. One of the best ways to generate traffic to your website is through a blog. Either build a blog on your own website or guest post on established blogs with audiences that you would like to draw back to your website. If work remains slow, continue to reach out to potential clients every week and promote your work on social media. Consistency is key. If you stick with it and continue to put out some sort of content, you will start to see results. It is those results that you can use to fuel your content creating and marketing strategy. If I can do it, you can do it, too. Of course it is going to take a lot of time and energy to build a freelance career. But if you dream of owning your own business, setting your own hours, working for yourself, and choosing your own clients, then use these steps as a trail to create your own path. Ashley Dorendorf is the owner and designer behind Ashley Rose Creative, a graphic and web design agency in Nevada. Ashley takes a customer’s vision from concept to creation in various aspects of a business including branding, website design and content creation. She is also a freelance writer. In her spare time, she enjoys spending time with her senior dog Walter, spending time outdoors and reading. This makes sense and seems doable. I really appreciate all of the stuff you share on this site, btw. Excellent! !